London based ETX Capital represent one of the ‘new breed’ of binary operators. Primarily a spread betting and CFD (Contracts for Difference) brokers, they have added binary options to their portfolio. They provide an excellent trading platform and due to them providing CFD trading in the UK, are fully regulated by the Financial Conduct Authority (FCA) Number 124721. While binary options are yet to fall under the authority of the FCA, it is good to know the firm themselves comply due to the CFD element of the business. Mobile App – Yes. Compatible across android, iOS (iPhone and iPad) and windows devices. ETX operate a specific Binary platform, with it’s own login. The first thing of note is that it is closed entirely while global markets are closed – there are no “randoms” or other virtual markets to entice clients to over trade. 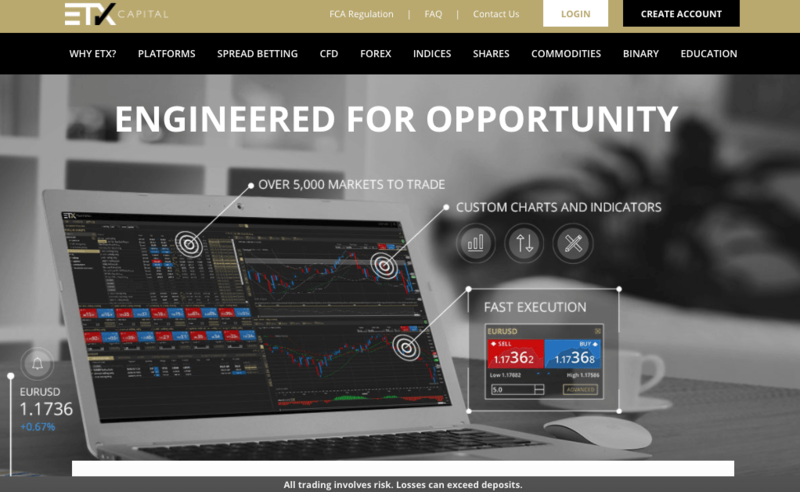 ETX Capital also offer CFDs and Forex trading, those platforms are covers in more detail in DayTrading.com’s ETX Review. The left hand side of the trading platform is the asset and options list. ETX provide the usual mix of assets – Forex, Indices, Commodities and Stock. The lists are extensive, with all major FX pairs covered. On certain option types (‘Long term’ for example), the asset lists will shorten as not all markets are available across all option types. Once the option and asset have been selected, the price graph will update on the right of the screen. From here, the expiry can be adjusted too, with incremental expiries available, plus ‘end-of-day’ expiry times. The stake level is above the price graph, with preset buttons available to quicken the trading process. The Call and Put buttons are clear, with the strike price illustrated between the buttons. Once highlighted, trader simply click on ‘Invest’ to confirm the trade. Once open, a trade will appear in the ‘Open Positions’ screen below the trading platform. The price graph will also show the current status of the trade, with either a blue (in the money) box or a red (out of the money) box highlighting the current direction of the trade. In the Open positions window, traders are offered a ‘Sell’ value for their trades. This can be used to cash in profitable positions, or to reduce loses on trades which have moved against the trade. Traders can login at any time to view their current positions and sell them if they want to. High/Low – The traditional binary – will the asset price be higher or lower than the current strike price at expiry? Short Term – The same concept as High/Low but these options have very short expiry times. At ETX, they are generally 60 second or 2 minute expiries. One Touch – ETX provide both high and low ‘touch’ prices. These finish ‘in the money’ immediately if the price level is reached or surpassed. The is no ‘No touch’ option however. Volatility therefore plays a key role. Spread High/Low – Unique to ETX Capital, these options have strike prices slightly above, or below the actual current price level. Beyond that, they behave just as a standard High/Low option. The difference is that the payout on the spread option is 100% – ETX can do this because their “spread” is covered by moving the strike price. It is a nice innovation, which some traders will enjoy. Long Term – Again, the trades behave as a standard High/Low, but these have longer expiry times. At ETX, these are generally the end of the month (the end of the last trading session of the calendar month). The range of assets is excellent and the option types are good – some additional expiry times within the long term range, and perhaps adding Ladder or boundary options, would mean ETX compete with the very best for trading choice. The mobile app has been separated from the CFD trading app, to focus purely on binaries. Available on Android (v3.0.0 and up) and iOS, the application delivers the same look and feel as the website, and all of the functionality. All assets and trade types are on offer from the mobile platform, as are trade history and account management features. The mobile app is available free to all ETX customers. The download is quick and simple, and traders can login and trade quickly. Payouts at ETX can reach 100%. This is due to the ‘Spread High/Low’ option, where the profit margin of the broker is built into the strike price “spread”. They can therefore afford to pay 100% on in the money trades. Elsewhere, payout are generally 75% or 80% – where assets are more popular, the payouts tend to be higher. The levels are certainly very competitive. Payouts will always vary based on the asset and expiry time, but ETX certainly tend to be at the higher level in comparison with rivals, and the ‘Spread High/Low’ trades give them an eye-catching headline payout. ETX offer some very tight spreads. For example, just 0.9 on EUR/USD and GBP/USD. Forex spreads are a particular strength, but ETX are competitive across the board. As a broker that is regulated by the FCA, ETX Capital have strict controls on deposit and withdrawal methods, and this in turn, ensures greater protection for the trader and their funds. There is a £100 minimum deposit requirement at ETX, though you must have sufficient funds in your account to open trades. The amount required will depend on the asset, and expiry. Deposits can be made via debit or credit card but these must be in the name of the individual (not a commercial card for example). Wire bank transfers are accepted, again they must be in the same name as the individual on the trading account. Deposits can be made via exactly the same options over the mobile apps. ETX accept deposits in a broad range of currencies, including GBP, USD, EUR, ZAR, SGD, SEK, RON, PLN, NOK, JPY, HRK, HKD, DKK, CZK, CHF, CAD, AUD. Withdrawals are a positive at ETX. Bank transfers should be process in 2 or 3 days – withdrawals to a debit or credit card will take a day longer. There no fees for withdrawals – unless traders make of 5 requests in a single calendar month. Any withdrawals over 5 within a month will incur a £10 charge. There is also a £15 charge per month for ‘dormant’ accounts. An account is deemed dormant if there are funds in it, but no trades have been placed over 120 days. 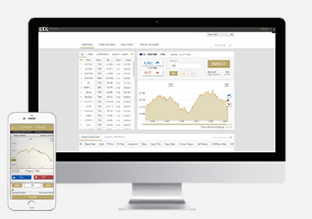 MT4 Platform – A great platform for advanced traders and technical analysis investors. Seamless integration on this popular platform. Tight Spreads – ETX offer some very competitive spreads compared to rival CFD and Forex brokers. Training Materials – Including webinars, which are very popular among users, and very helpful. Excellent Reputation – ETX generate very few complaints, and enjoy high satisfaction ratings from their user base.